In honor of the close of Newsweek's print edition last month a former intern looks back on one summer, 13 years ago. In the summer of 1999, if you had been an intern sitting on the foreign desk of Newsweek, you might have done a few things. You might have ditched your college clothes for some still-evolving sense of "office wear" like I did. You definitely hung out a lot at the fully-stocked cafeteria at lunch and, on Friday nights, ushered yourself right on up to the top floor dining room with everyone else for dinner overlooking Central Park. You might have been impressed, like I was, by the crystal and the tablecloths. You might have noticed the weight of the silverware. You saw the flower arrangements. You ate steak. And you couldn't help but look out over the cool, dark expanse of Central Park and the fading sparkle of north Manhattan. You might have picked up on the fact that this was the kind of publication where you could pitch a whole front-of-the-book spread on something you might decide to call "Housewife Chic" and get it in. You could decide that Kosovo and Africa and China were all doing fine and could take care of themselves and that there was therefore plenty of time to secure the handkerchiefs and aprons and hand brooms for the shoot. You could stand around and "oversee the shoot." When someone else, someone also standing around and also "overseeing the shoot," asked if you were a model, you could say, "No, I'm with the magazine," with real pride and a touch of dismissal, like I did. You were in a place that mattered, that was not just participating in but setting the pace of a national if not global conversation. And so it mattered that, according to Housewife Chic, women were wearing handkerchiefs on their heads in some quasi-ironic way or possibly in a totally earnest way, you didn't know which, but you would catch it and report it and, therefore, you would matter too. You could go upstairs for a steak afterward, or take a car with an editor. You could get dinner. 9/11 was just over two years away. That summer, the work at the foreign desk was all about Kosovo and the fact that female genital mutilation was going on in Africa and that the Chinese Communist Party had made it all the way to fifty years old. I rushed around in kitten heels, presenting this or that line of text to this or that editor, connecting a writer's incoming phone call, waiting for the final ‘go ahead' on a piece. If I ever stayed late for any reason, for any reason at all, there was always a car with a driver to take me home without question, any hour, anywhere. Editors had two-hour lunches at the French restaurants nearby. They compared the food to their own dining room, measuring all the ways in which Newsweek's fare really did come up short. An editor at the magazine took a special interest in me or, as I understood it at the time, in my work. He offered me more pieces. He asked me to report this or that little story and published my writing, almost without changing a thing. What he didn't run in the magazine he put online. He asked me to lunch. "Come out," he'd say. "I want you to meet so-and-so." When he went away for the weekend he started handing me his keys. "I'll need you to water a few plants while I'm away," he'd say. "Never mind if they're dead. If they're not dead, don't kill them. You think you can handle that?" I spent those quiet Sundays and Mondays—the Newsweek workweek ran Tuesday through Saturday—walking through the grand expanse of his Greenwich Village apartment. At night, I could see myself in the black reflection of his massive windows. I marveled at his stacks of subscription magazines and art books, his expensive, pre-ground coffee, his way of living in New York. Late one Friday night the editor called me at my desk. "When you're done tonight, come meet me at this bar," he said. "Ask a driver to drop you off." I said okay. I walked into the bar. I had just turned 22. I looked about 16. I waited for someone to ask for my ID. No one asked for my ID. The editor was sitting with a glass of wine. We talked for a little while. I have no idea what we talked about. I remember thinking he wasn't making much sense. It took me a while to realize how drunk he was. "Come back to my house," he said, steadying himself against the stool. "I want to show you some pictures of my wife. She was so beautiful. But she died." He swooned and teetered. He tried to put his glass down. Eventually he made contact with the wood of the bar. "It would mean so much to me to show you photos of her." I told him I didn't think I could go back to his place. I remember thinking I couldn't go back to his place. "Just come back to my place," he said. "It's not like you haven't been there before." This was true. I had been there before. I had house-sat his dead plants. Who was I to say no to going back there again, to this place where I had been before? Especially now, at this moment, when it mattered that I looked at photos of his dead wife. He showed me the photos, framed pictures in his study that I never noticed while I had wandered through his apartment in my bare feet, my house-sitting ways. "Here she is with Barbra Streisand," he said, tipping up a photo of a woman standing next to Barbra Streisand. Why did I say the word ‘wow' to this? I said the word ‘wow' to this. He offered me a drink. I told him I was fine. I asked if there was anything else I could do for him. I started to wonder if I should leave, if leaving would be the right thing to do or what the right thing to do would be. This was a Newsweek editor. It was important that I did the right thing. The editor pushed me down onto his huge white couch. Both his breath and his body were so heavy, so much heavier than I had ever thought possible. It seemed impossible that another human being could be so heavy, so total. His hands were on me, his mouth a gaping fish. I couldn't push him off me. No amount of Vassar or pencil skirts or housewife chic or tablecloths or steak or drivers or house-sitting, even, could push him off me. Being unable to move, I spoke. I said "no." That was one instant. It could have been the most significant instant, cleaving two halves: my life before and everything after. But that's not what that instant was. That instant was, instead, only the one before the next, in which the editor got up, rubbing and shaking his head. He told me he just missed his wife so much, you see, and that I reminded him of his damn wife who really had died and who was now dead, in fact, but that I reminded him of her, in this funny way. I really did. I said I needed to leave. He told me he would get me a cab. I remember not understanding this—why couldn't I get a cab myself? Why would he need to get a cab for me? The editor stepped into the elevator with me. I pressed the button and stood in that stupid metal box waiting for the lobby to come. Outside, the editor waved down a taxi and opened the door. He pecked me on the cheek. From Greenwich Village to St. Mark's Place was not far enough to wipe the feeling of that kiss, of any of it, away. A few hours later, I heard JFK Junior plowed his airplane into the Atlantic. We were all back to the office for the full weekend to scrap what had been the week's issue and put together a whole Kennedy package. During all the slow time in the office that weekend, while I waited to connect this or that phone call for a writer "in the field" or send a few lines of text from one floor to another, I looked back through all my emails, through every piece of communication with the editor. What had been the signs? Had there been any signs? In my eagerness to be liked by this editor, to get some opportunity, to be right, had I overlooked the most basic thing? What was the most basic thing? It's always been a cliché to hit up the intern. But the summer of 1999 was an especially cliché time to hit up the intern. Clinton's impeachment trial had just concluded that February. The country was ablaze with intern improprieties. While I reread those old emails, I remember thinking, this is so weird. I look nothing like Monica. I'm an intern, but I'm not that intern. I didn't realize that all interns look the same, are the same, to some people and in some places, places where hallways are "corridors of power" that lead to dining rooms where even crystal glasses are used to serve the water. It helped that I knew nothing of the magazine's history, of Nora Ephron's experience as a young hire or of the 1970 class action lawsuit 46 women brought against Newsweek. The summer ended. The magazine made it clear I could stay if I wanted to. At that time, Newsweek regularly filled entry-level positions from its crew of summer interns. But the summer internship was only ever going to be that for me—a summer internship. I had long ago secured a one-way ticket to China and a job at a Chinese university starting that fall. I cleaned out my desk. Everything fit into one cardboard box with room to spare. You can't accumulate much in three months when you know you're leaving anyway. "Keep in touch from China," one of the foreign editors said to me. "Maybe you can file something for us." Clinging reverently to any chance to do just that, I didn't tell anyone about my experience. I only saw the editor who had thrown me on his couch one last time before I left. I remember his face, how surprised he looked. How we hadn't spoken since that night. How he thought I was already gone. How he made a joke about why I wasn't gone yet. A few months after I moved to China, Newsweek tried to send me a copy of its special 50th anniversary issue on the founding of the Chinese Communist party. I had worked on this issue, in my hushed way. When I received an empty envelop from the magazine, I wrote the foreign desk. I explained the issue had been confiscated in the Chinese screening process for sensitive material. Someone sent another one. Tsinghua University solemnly delivered a second large, empty envelope. When I learned that Newsweek's print edition would close this year, that the magazine was not only not what it was but that it would be nothing at all, that now-editor Tina Brown was talking to New York magazine about "an era when there were things like private dining rooms," I started to think about that time, thirteen years ago. About how gilded and excessive it had been. How everything had seemed possible, any silly, front-of-the-book story, any long lunch, any intern in any apartment, on any couch. And how I hadn't seen it that way at the time, any more than Newsweek, up until this year, could have seen it this way, a way without print, a way defined by its partnership with a faster, younger site. What troubled me recently was that I couldn't remember that editor's last name. So I walked down a lower Manhattan street and stood in front of his door. I knew if I saw his last name on the door panel that I would know. And it's true. A name on a door panel can bring everything back, can make you 22 again and gullible and getting pecked on the cheek before being put into a taxi a two in the morning. These days, a sandwich bar is open next to his apartment building. I walked in and ordered a sandwich. I asked the bartender if he knew this guy, the editor. He said he did, that the editor came in all the time, practically every night. That he was a good guy. He asked me how I knew him. I said I didn't. I asked the bartender if the editor was still an editor. He told me no, he was retired now. The bartender gave me my sandwich and asked me if there would be anything else. I saw I had enough cash, that I wouldn't have to leave a credit card and therefore my name, and, feeling safe and anonymous, I put all the change down for the tip. I told the bartender that I actually used to be that editor's intern at Newsweek. He looked a little amused. "He was a real predator," I added. "Really?" the bartender asked. "Sexually?" "While his wife was still alive?" he asked. "No," I said. "She had already died." "Well, there you go," the bartender shrugged. "His wife had died. Poor guy." "Well." The bartender wiped his hands with a cloth. "His wife was dead. Don't you think that counts for something?" I took the tip off the counter. I put the money back in my bag. The bartender watched me. It's true we rarely understand events as they happen. 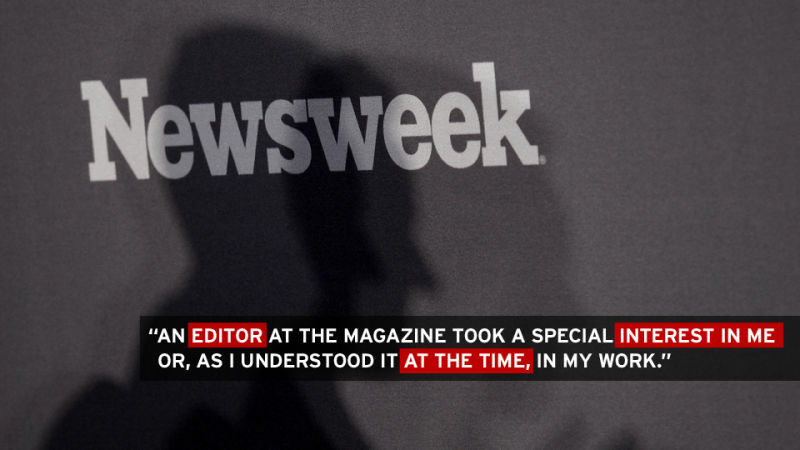 Part of me wants to say I sensed at the time that Newsweek was bloated, overfed in every sense of the word. But that's hindsight, not insight. At the time, Newsweek seemed to me the center of the world where a benevolent editorial eye could glance to a far away, genital-cutting Africa and the good money was on the Chinese Communist Party failing long before this celebrated American magazine ever would. "The party can't go on forever," a foreign editor told me as I got ready to move to China. He was referring to Beijing. But he could just as easily have been talking about his own job. Or some previous incarnation of this city. Or of being 22. I left that sandwich bar unsure of why I had come there, unsure of why I had stood outside this now-retired editor's apartment, unsure of why I told the bartender anything at all and unsure of what to do in the face of "poor guy" other than take some bucks back. I was trying to be resolved. I'm still unresolved, 13 years later, even as the weekly publication has become obsolete and the news cycle is down to one continuous stream. So Newsweek, in its way, is trying to resolve into something else. It's still not something else. Or, rather, it's a little pixilated graphic in the right hand corner of that faster, younger site. Caroline Cooper is a writer and graduate student at Columbia University.